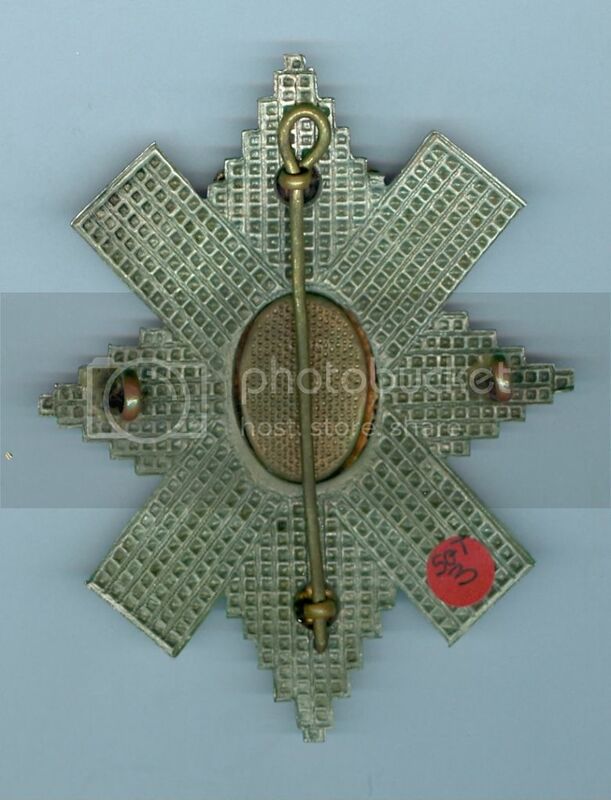 An officer's silver plaid brooch hallmarked Edinburgh 1881. The marks include the date letter, a thistle, and the Castle as would be expected. Another mark appears to be facsimile of a bust of Queen Victoria. The significance of the latter is a mystery to me. Any ideas? Last edited by mike4279; 31st March 2012 at 15:32. Top is a sergeant's bimetal badge 1868-1901. Appears to be copper on top of white metal. "Lacesset' spelling, and Sphinx has tail up. Bottom is an officers glengarry badge 1902-1936. Cannot date it any narrower than that. Gilted circlet, wreath, crown, and sphinx; star is silver. 'Lacesset' spelling, and Sphinx with tail down. never seen one north south before circa 1840-1860. Unsure about the provenance of the 42 centre badge, have you a pic of the reverse? Victoria's head on the plaid brooch is the Sovereigns head duty mark in use untill 1890. Thank you for the clarifications on my badge postings. Photo of the reverse of the 42 centre badge is enclosed. Please let me know if you have any further thoughts on its provenance. Mike, there are a few concerns I have about this badge. The numerals are not separate items, the star is die cast not die struck and the reverse is excessively dirty.There is a triangle of flash or overrun either side of the sphinx. 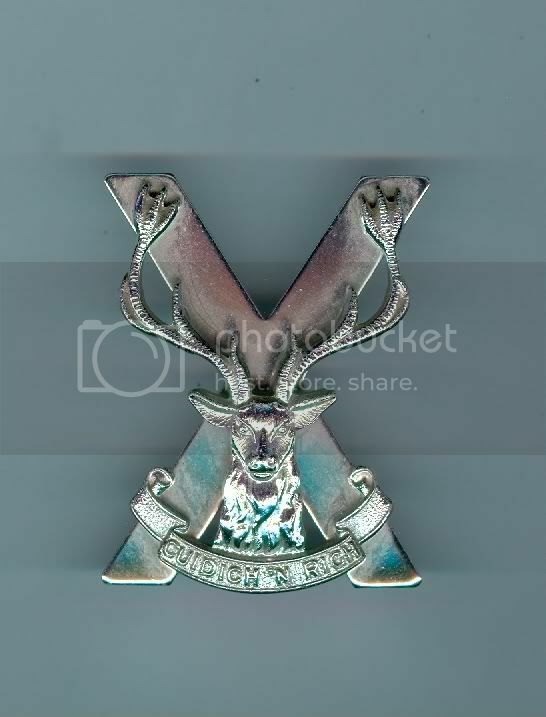 There are lots of reproductions of this badge in the UK and although I have never seen this particular version I have my doubts. Hve posted the reverse of one of my 42 badges. ORs Highland Brigade in aluminum 1958-68. I grasp your point about the questionable authenticity of my 42 badge. Actually, this badge was one of the rare occasions when I acquired an item from a not fully trusted source. I bought it back in the 1990s from a dealer at the old Saturday morning militaria mart at Camden Passage in London. Any idea if that mart is still in operation? In any case, it is a bit too late to get my money back! Displayed below are the shoulder belt plate and waist belt plate from my full dress uniform mannequin. Both have the 'R&HB Kirkwood' maker's tablet on the reverse, and both retain almost all of their original gilt. I would like to clean up the patina from the silver parts of the badges, but I am afraid of breaking the cotter pin in the back in order to disassemble the pieces to clean the silver items without damaging the gilt. Are you aware of anything that would clean gilted surfaces without inflicting damage? Mike, to clean silver try pure lemon juice on a cotton bud, to get in the corners splay the end of a matchstick to apply juice. Gently polish with a silver cloth. Test on the back of badge first, you will need a lot of patience. To clean gilt (more difficult) use liquid detergent mixed with ammonia, wash off with warm water and dry with a clean cloth. The Camden market stalls closed about 5 years ago. 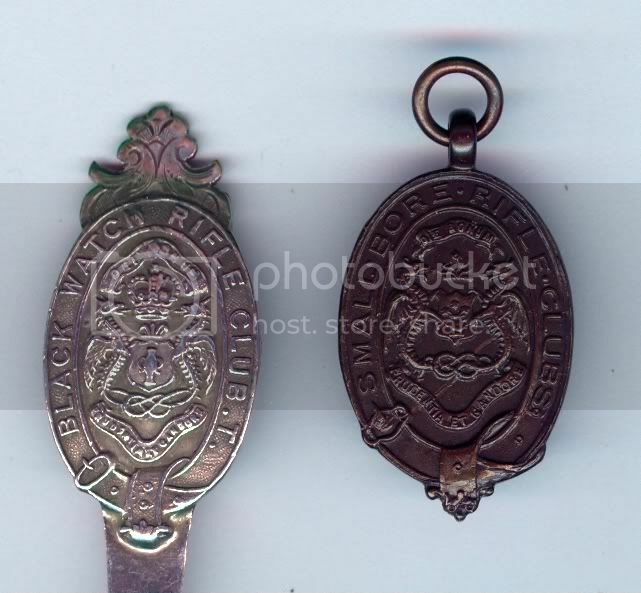 Dundee smallbore rifle club bronze medalet, compare with BW rifle club spoon. 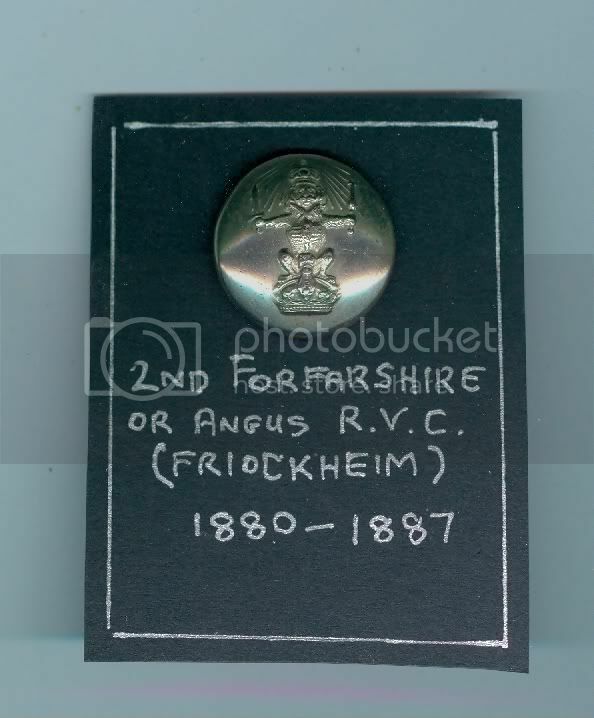 White metal button Forfar Vols, became 2VBRH in 1887.